Krispy Kreme is making a Canadian comeback. The popular U.S. chain first invaded Canada in 2001, but failed badly. Now it's got a new look and a new plan. Patrick Brennan went big with his Krispy Kreme order: 12 original glazed and six each of the maple and chocolate iced. He hadn't eaten a Krispy Kreme doughnut in about a decade, so when he spotted a new location near his work, he felt compelled to check it out. "I've been dying for it," said Brennan. "The doughnuts are just that good. They're so rich." "It's a longtime coming," he said of the new downtown Toronto store located near Kensington Market. Yes, Krispy Kreme is cooking up a Canadian comeback. The global chain, headquartered in the U.S., is today celebrating its 79th birthday. When the company first invaded Canada in 2001, excited customers waited in long lineups for a taste of its famed hot-glazed doughnuts. But the excitement didn't last. By 2005, many stores shut down and the Canadian franchisee filed for bankruptcy protection. Now, the franchise has new owners and a new recipe for success. The plan is to open up to 50 locations across Ontario and Quebec within the next five years and then spread to the rest of Canada. 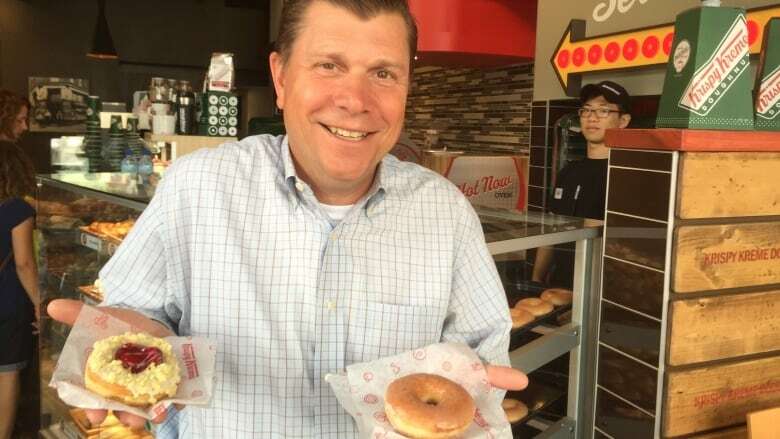 "We definitely want to continue to grow the brand," said Chris Lindsay, co-CEO of Krispy Kreme in Canada. The new Toronto location, which opened last month, is bustling with customers eager to sink their teeth into a Krispy Kreme. "The combination of the apple and the cinnamon is absolutely amazing," said Satya Sandhu while devouring an apple fritter doughnut. She sat in a cozy booth by the window with her husband, Surinder, who enjoyed a coffee. This new location has a different concept than the Krispy Kreme outlets you may remember. It's a café-style shop that also serves up specialty coffees, frozen drinks and a variety of baked goods, such as bagels and muffins. The franchisee opened two previous café-style Krispy Kremes in downtown Toronto in 2010 and 2012 to test the market. "We think there's a lot of potential now that we have the new model," Lindsay said. 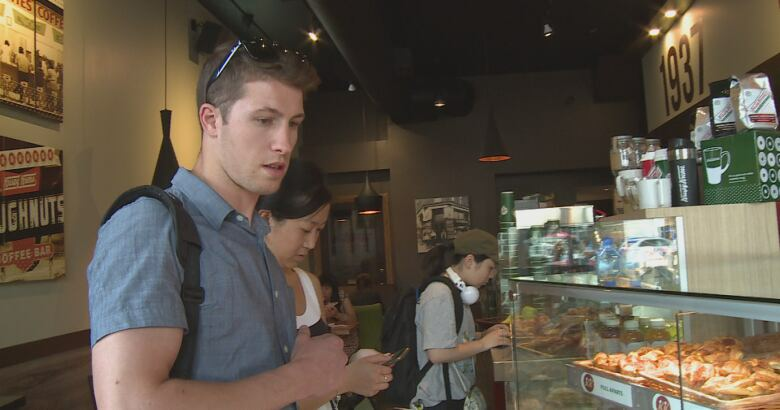 The smaller, more intimate doughnut shops are a far cry from the big bustling factory-style outlets the chain set up during its first foray into Canada 15 years ago. The original plan was to open 32 factory locations in Ontario, Quebec and the Atlantic provinces. The outlet-style stores had already proven a hit in the U.S. The company's arrival was met with great fanfare. Unlike competitor Tim Hortons, Krispy Kreme doughnuts rolled out fresh and hot on a conveyor belt. But before the decade was over, the thrill had gone and most of the 18 factory stores closed. "They just expected that their U.S. model would roll out into Canada and everyone would love it and they would take Canada by storm," said Robert Carter of Toronto-based market research company NPD Group. What Krispy Kreme neglected to factor in, he says, is that Canadians don't eat as many doughnuts. "We're not consuming the same amount of deep-fried, fatty foods as they do in the U.S."
In hindsight, co-CEO Lindsay says, the focus only on large factory stores that cost up to $3 million each to build was a mistake. He maintains the stores did well, but "just not well enough to support the infrastructure that they had built all around them." Only three of the original factory locations are still open: two in Quebec and one in Mississauga. Lindsay says future Krispy Kremes will be a combination of the smaller, cheaper cafés in urban areas and factory outlets in places where real estate is less costly. The factory outlets are needed to supply doughnuts to the cafés, which have no room for baking. That means cafe customers can't get a classic Krispy Kreme straight from the deep fryer. Instead, fresh doughnuts are delivered twice a day. Plus, café customers can get their orders reheated in a new "hot now oven." Even with a new approach, will Krispy Kreme manage to take a bite out of the Canadian market? NPD's Carter is skeptical. He says the quick service restaurant market is flat. So for the chain to grow, it will have to steal customers from competitors, including the fiercest of them all, Tim Hortons, "the No. 1 dominant doughnut player in Canada." Carter says many customers don't just seek out doughnuts; they also want a coffee and maybe lunch. So for Krispy Kreme to survive, he believes it must expand its menu like Tim Hortons and offer more food and coffee choices. "For Krispy Kreme to come in on a platform of doughnuts and expect that they're going to experience growth is very shortsighted." For fan Brennan, the taste of a Krispy Kreme doughnut is enough to keep him coming back. But based on past experience, he's not taking it as a given that the new Toronto location is here to stay. "They never seem to last, so I'm hoping this time that they do."